In stark contrast to the opening game of the 2014/2015 Bundesliga season, Thomas Tuchel’s Borussia Dortmund put in a dominant performance against the Foals to win 4-0. As expected, Tuchel’s side showed in a 4-2-3-1 formation featuring Gundogan and the excellent debutante Julian Weigl as a duo in a double pivot. Roman Burki took on the number 1 spot for the his first Bundesliga game at Dortmund ahead of quite a commonly-seen defensive chain of Schmelzer, Hummels, Sokratis and Piszczek. The excellent Weigl was key in supporting Hummels as he sat at the left side of the deep midfield partnership and situationally dropped deep and to the left half-space to aid the penetration down the left side of the BvB 4-2-3-1. To his right was Ilkay Gundogan who also put in a fine performance in supporting the combinations down the right where they usually began to develop possession. Henrikh Mkhitaryan scored twice from a position on the wide left as he functioned well in the trio involving Kagawa and Reus, all of whom were flexible in their movements and played key roles in the attacking strategy. The foals came to Dortmund with their usual 4-4-2 system despite a few personnel changes over the summer, including Max Kruse’s transfer to Wolfsburg. A young pairing of Schulz and Christensen made up the central defensive pairing whilst they were flanked by Jantschke and Wendt on the right and left respectively. Granit Xhaxa and Lars Stindl took the double 6 positions whilst they were flanked by Johnson and Traoré. Raffael took on his role from last season as the second striker behind new signing Drmic. Over the course of last season, one of the biggest issues with Klopp’s Dortmund was their lackluster possession game. Throughout the season they lacked the playmaking abilities to break down any defence which sat deep and compact against them which became the norm for their opposition as they dropped down the league rankings. It was always expected that under Tuchel this area of their game would see vast improvements and they are evident to see even in the first league match of the season as Dortmund looked much improved with the ball. 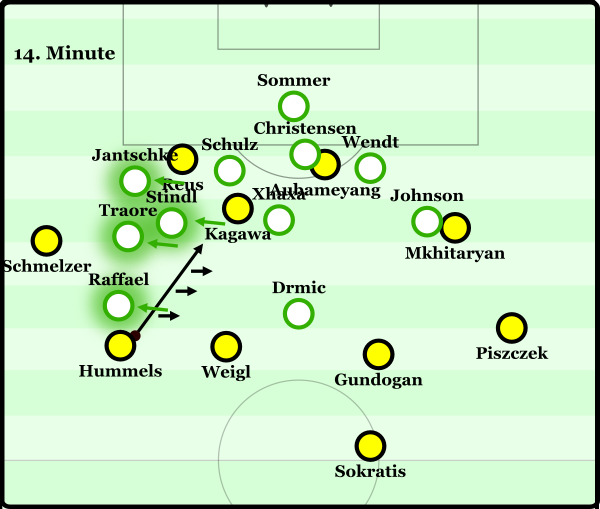 The general attacking strategy of Dortmund was to penetrate the Gladbach block through the left half-space following a switch. Throughout the game it was executed to great success but primarily in the first half where the scoreline finished 3-0 already at the break. This may have been chosen to exploit the strategical advantages which the half-space offers, such as the angle of attack, whilst players such as Hummels, Weigl, Mkhitaryan and Kagawa were all in access from this position. Their tactics in doing so was usually to build possession down the right, using Gundogan and Piszczek to aid ball circulation through local combinations as well as the important connection game in the wide area. From this position they could then switch the ball to Hummels, who against a passive and poorly-shifting Gladbach defense could drive forward and penetrate the open passing lanes. Due to the passivity of the away defence, Dortmund rarely had difficulty in performing the initial stages of this tactic as there was never enough pressure to effectively isolate nor the access to prevent the switch. A perfect example of this was for the first goal. Dortmund positioned well to switch possession through the defensive line. Following a local combination between Sokratis, Gundogan and Piszczek against the passive defence, the right centre-back switches the ball to Hummels after some encouragement from Weigl. The German centre-back is primed well and is already moving forward into the half-space to then attack Gladbach when the passing lane into Kagawa between the lines becomes available. BMG shifted poorly with a lack of co-ordination down the right side of their 4-4-2, resulting in a passing lane being opened for an excellent diagonal pass by Hummels. Because of the lack of co-ordination in the shift of Gladbach, there are issues with the defensive spacing and as a result, a passing lane between Stindl and Xhaxa is open for Hummels to find Kagawa. Throughout the whole moment there is a total lack of pressure from Gladbach and this makes for easy access into spaces within the block for Tuchel’s Dortmund. The type of pass from Hummels in this goal is quite vital to the eventual assist from Kagawa. A penetrative diagonal pass between 3 Gladbach players, the ball from the German centre-back was of a very high quality and worked perfect with the situation. The angle itself made it near impossible for Gladbach to recover in time as the movement was going against the movement of the Gladbach players, who were shifting to the their right whilst the ball was moving to the left of them. This means that in the time from Hummels’ pass to Kagawa’s assist, the Gladbach players cannot change direction and effectively form a press in time to cut the assist off. The diagonal pass contrasting in the directions of the movements of the local BMG defenders. Another aspect is the change in goal pressure and general value of ball position. As I discussed in a previous article, diagonal passing is the best way to not only gain space through a pass, but move the ball into a less defensively-controlled area due to the change in horizontal position. In the case of the first goal, Hummels moves the ball from a relatively week position in the deep left half-space into a central position closer to the goal. Not only is this bypassing the four defenders to the left of Kagawa, moving the ball into a position which is covered poorly by Gladbach (as a result of the horizontal change) but it also moves the ball further up field, increasing pressure on the Gladbach goal. By making the diagonal pass, the ball not only gains space but the change in horizontal position creates new issues for the defence. Finally, one more point on the importance of the diagonality in this pass is the angle which Kagawa can receive it in. One of the key issues with a vertical pass is that the recipient is always receiving the ball with his back to the goal so if there is immediate defensive pressure, their options are limited. However, as this pass is coming into Kagawa at a diagonal angle, he can easily move the ball onto Reus in one move which is too quick for any defensive pressure from Xhaxa or Schulz to interfere. The opening goal highlights an important factor in Dortmund’s attacking strategy as they looked to maximise the playmaking abilities of Mats Hummels. 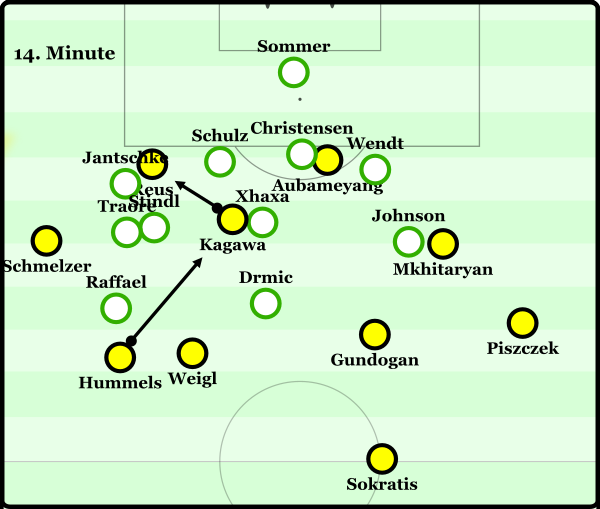 As I stated previously, Dortmund frequently looked to build down the right to prepare for penetration on the left, which was commonly done by Hummels as he broke the lines of Gladbach on a number of occasions. For the first two goals in fact, the German international provided the second assist – initially for Kagawa and then for Schmelzer whose cross was converted by Aubameyang. He was supported well by the movements of Weigl, whose positioning often gave the freedom to Hummels to drive forward whether it be through dropping to create a three-chain or simply moving to cover the space behind. In all the young midfielder showed intelligence as his positioning brought balance and important connections to increase the stability of ball possession. 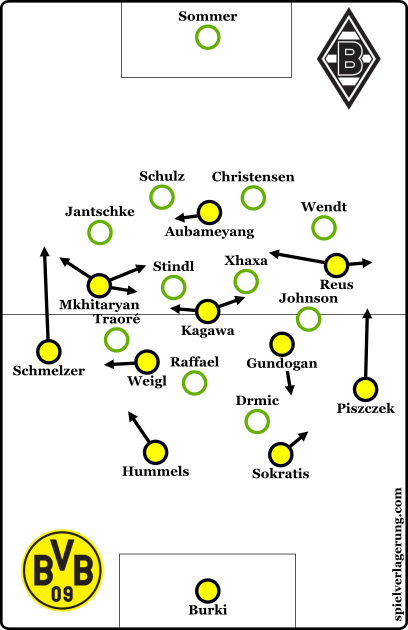 The overall attacking strategy of Dortmund was reflective with the small contrasts in roles of the two full-backs. 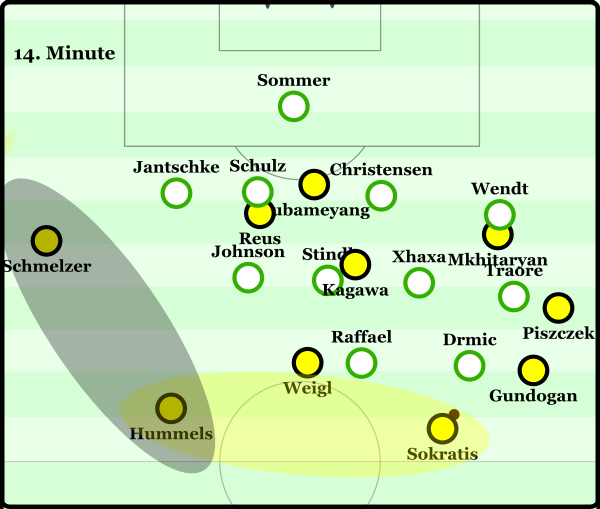 On the left, Schmelzer played a very high role which supported the spacing higher up the pitch as well as forming an effective partnership with the inside movements of Mkhitaryan. From these positions he stretched the defence and could potentially deliver crosses as he did for the second goal where an unchallenged Aubameyang capitalised on an impressive ball from the touchline. 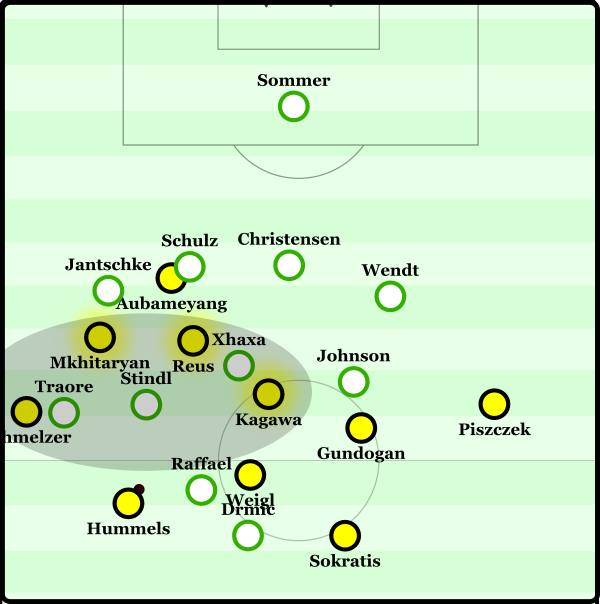 On the other flank, Piszczek’s positioning was less aggressive than his German teammate as the Pole was more oriented to supporting the possession game and particularly the development of the ball in the early stages. He supported the connections and deep combinations from the defensive chain alongside Gundogan who was shifting to the right half-space. In this ‘partnership’ of sorts, Piszczek supports the stability in the building game on the right side of the pitch whilst Schmelzer is more oriented to aiding the penetration down the left. The flexible ‘3’ behind Aubameyang supported penetration well. Further up the pitch, the front four were much more flexible, especially in comparison to the possession game of Dortmund in recent years. In particular the movements and orientation of Reus and Mkhitaryan were loose as they roamed off of the ball to come inside and support the overloads of the passing lanes. All 3 of the trio behind Aubameyang made ball-oriented movements throughout the game, meaning that they could work well to create access through the ball-near passing lanes when the likes of Hummels and Gundogan were in possession. This is a positive contrast to last season, which saw a much more static and rigid attacking midfield which was just one of the contributors in a stagnant possession game. Later on the game, particularly in the second half when the state as a more-than comfortable 4-0, Dortmund were slightly less aggressive in possession. Their ball circulation in the Gladbach half was more passive than in the first half as they formed combinations around the defensive block to create the necessary stability of the ball. This showed in the roles of the ‘3’ who were more oriented to supporting ball security as opposed to their more penetration-minded roles in the first 45. Aside from this, Tuchel’s Dortmund were more selective in their passing and would be more patient until attempting to break the lines of the opposition. As suggested by the scoreline, the performance was very uncharacteristic of Lucien Favre’s side who are usually excellently organised and compact in their 4-4-2 block. Their defensive organisation has seen them perform above the average expectation in past seasons and was the key factor in their 2-0 win over Bayern towards the end of the 14/15 campaign. However, on the opening week of the new Bundesliga season, Gladbach were surprisingly a shadow of the team from last year in what was certainly an off-day for Favre’s team. They were particularly passive in the midfield pressure within the 4-4-2 block. 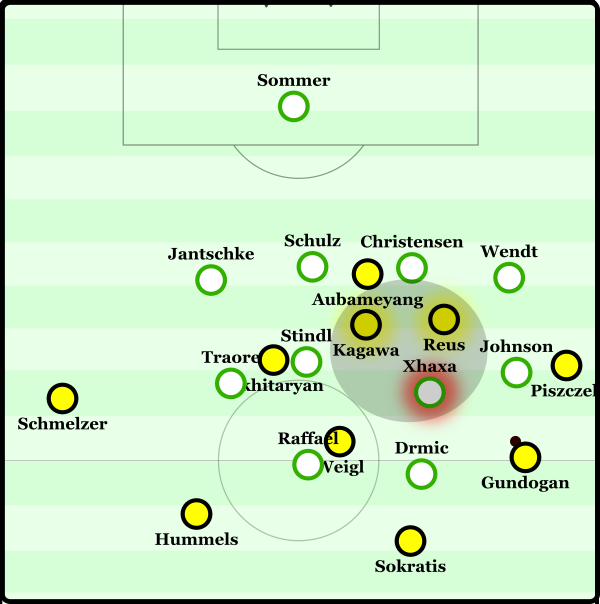 On a number of occasions when Dortmund broke the first line of pressure, Gladbach did not always have great access and would be too slow in pressing the ball away from the dangerous area. As expected they let Dortmund keep possession for long periods but then could not adapt when the inevitable increase in tempo occurred from Tuchel’s side. The lack of compactness within the midfield, as well as some situational lack of compactness horizontally also. Another issue was their lack of compactness within the defensive block. Although horizontally and vertically they were relatively compact, though not to the usual standards of Favre’s team, they lacked compactness within the defensive block, especially in midfield. This caused problems in their defense against diagonal passes from Dortmund; an example being the first goal. When the ball was in wide positions, the block had large spaces within the midfield which were open to penetration from the diagonal passing of Dortmund, particularly when Gundogan was in possession as he shifted to the right half-space and wing from his 6 position. The above was a common scene throughout the game and the combination of the lack of spatial compactness and the passivity of the pressure. When a defending team lacks the access to press the ball efficiently, they provide a short window of time where the opposition has the freedom to make a pass without the disrupting presence of defensive pressure. It is in these moments where aspects such as a lack of compactness can be exploited as the ball-carrier is in the conditions which allow him to play a pass without the restrictions which come through opposition pressure. Though Tuchel perhaps rightfully did reference Klopp after such a fantastic victory for Dortmund, the improvements on last season were telling already, albeit against a surprisingly disappointing Gladbach performance. Great analysis, especially your breakdown of the first goal. I hadn’t understood Weigl’s role in giving Hummels more freedom until reading this. Some of your points are really helpful for us coaches to put into practice: attacking the right to then penetrate on the left, half-spaces, diagonal passes. Much appreciated!